Prospector’s Mount Nittany Rib Company opened doors at its new location on the Benner Pike on Feb. 3. STATE COLLEGE — After years without a home, longtime Centre County business Prospector’s has found a new place to serve up its barbeque on the Benner Pike. Prospector’s Allegheny Rib Company fed State College’s hunger for barbeque at its old Cato Avenue location in Ferguson Township from 1996 until 2011. 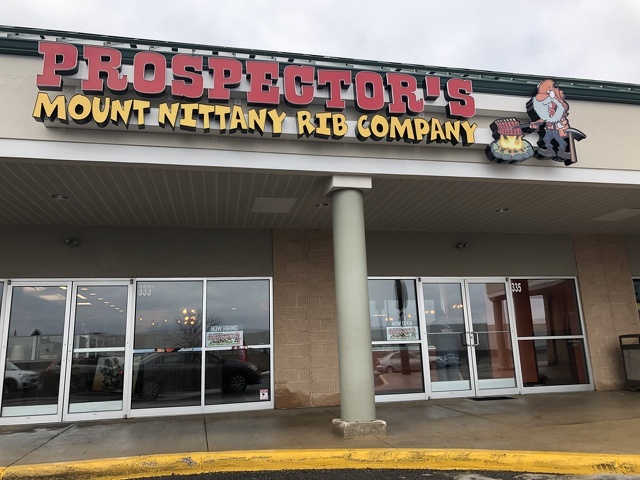 Since then it operated as a catering and concession stand outside of Beaver Stadium, until the restaurant announced last year its new permanent location as Prospector’s Mount Nittany Rib Company. They opened the doors on Feb. 3, much to the delight of fans looking for barbecue for the big game. Prospector’s takes over the 333 Benner Pike location formerly occupied by Dickey’s Barbecue Pit, which closed its doors in 2017. The new spot looks to be a fast casual eatery, similar to Chipotle or Panera, but with barbeque. Ribs, brisket, wings and barbeque chicken will be on the menu. Hours are 11 a.m. to 9 p.m. Monday through Saturday and noon to 9 p.m. Sunday.